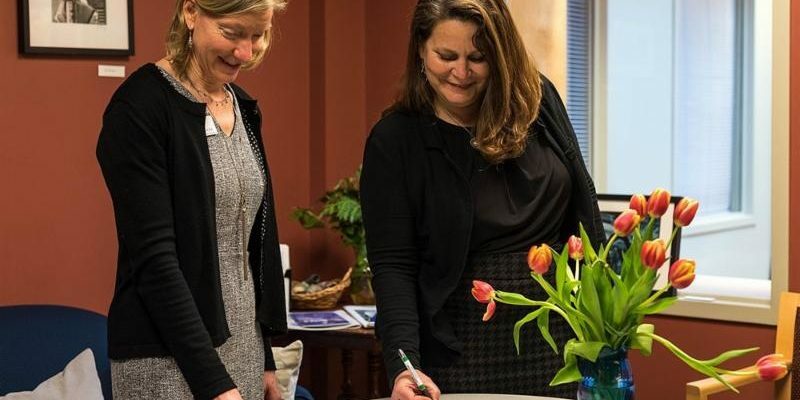 L﻿andmark College President, Dr. Peter Eden, recently signed a Memorandum of Understanding (MOU) with our Co-Founder, CEO, and President Carolyn K. Jeppsen. Starting this summer, three Landmark College students will take part in a Work Based Learning Semester, during which they will participate in our summer program. (pictured at left, below). " Nationwide, less than half of the students with learning disabilities find employment within two years of graduating," said Coplan. "We believe the education Landmark College provides combined with the BroadFutures program will have a positive impact on those numbers." We are expanding our summer program to hopefully include two classes. We have some fabulous new employer partners joining us this summer and returning committed employers as well. We are already accepting and processing applications. We are thrilled this month to shine the spotlight on our employer partner, Senator Van Hollen-we also partnered with him when he was a Congressman. While a Congressman, Senator Van Hollen was the first recipient of the BroadFutures Champion Award. We feel very fortunate to have such an inspired employer partner and role model for our interns. Senator Van Hollen is a staunch, proud and successful advocate for ensuring equality for and improving the lives of individuals with disabilities. he has worked hard to ensure the protections afforded under the the Americans with Disabilities Act ("ADA") of 1990 are upheld and enforced. In the House of Representatives as a Congressman, he was a passionate advocate for disability rights legislation. He was the lead Democratic sponsor of the ABLE Act and has been a leader in efforts to ensure funding for disabilities services, introducing the IDEA Full Funding Act. He has fought for legislation empowering and expanding coverage of the ADA and was an integral part of the bi-partisan Congressional team that successfully passed the Affordable Care Act. Hosting interns in coordination with BroadFutures has been a wonderful experience for our office. There's no doubt that they enrich our work environment, and my staff and I are grateful for their contributions." "I hope our interns have enjoyed their experience with us as much as our team has enjoyed working with them. Ensuring access to integrated and meaningful employment for individuals with disabilities is a top priority of mine. That is why I introduced the Transitions to Independence Act, which would provide incentive payments to states that meet benchmarks for expanding integrated employment for people with disabilities. Individuals with disabilities can make such a meaningful contribution to the workplace and it's crucial that they have the chance to do so. Thank you to Senator Van Hollen and your amazing staff, and we look forward to continuing our partnership!!! if you are interested in attending this movie event! Raymond Caldwell is our inspired Drama Coach who is integral to our mission and works with us to deliver our interactive workforce curriculum. Raymond is a gifted and talented professional who is consistently rated by our participants as one of the most empowering portions of our program. Raymond is the Associate Artistic Director at Theater Alliance and Resident Director Lecturer in the Department of Theatre Arts at Howard University. Raymond holds an MFA in Acting with a focus in community outreach from the Ohio State University and a BFA in Acting from the University of Florida. Raymond has toured nationally and internationally and has worked with playwrights and artists from around the world. He received the Allen Lee Hughes Fellowship in Community Engagement in 2009, and the following season, he joined the Arena Stage staff where he worked for 6 years as both an administrator and artist. As an artist/director/divisor he has developed work with various schools and organizations throughout the US in addition to working with diverse populations in India, Ukraine, Greece, Germany, and the UK. "BroadFutures is transforming the lives of young people through its holistic programming. I love that I get to be a part of an organization that understands the important role that art and creativity play in developing workforce skills. Witnessing our interns' development and growth in dynamic and measurable ways makes my work with BroadFutures incredibly fulfilling!" We are thrilled to announce our new partnership with Landmark College! We are expanding our summer program to hopefully include two classes. We have some fabulous new employer partners joining us this summer and returning committed employers as well. We are already accepting and processing applications. If you are interested in applying for our Summer 2018 Program, please do so HERE. If you are interested in becoming an employer partner, we are actively recruiting new employers. Please find out more HERE. We are thrilled this month to shine the spotlight on our employer partner, Senator Van Hollen-we also partnered with him when he was a Congressman. While a Congressman, Senator Van Hollen was the first recipient of the BroadFutures Champion Award. We feel very fortunate to have such an inspired employer partner and role model for our interns. Senator Van Hollen is a staunch, proud and successful advocate for ensuring equality for and improving the lives of individuals with disabilities. As both a Senator and Congressman, he has worked hard to ensure the protections afforded under the the Americans with Disabilities Act (“ADA”) of 1990 are upheld and enforced. In the House of Representatives as a Congressman, he was a passionate advocate for disability rights legislation. He was the lead Democratic sponsor of the ABLE Act and has been a leader in efforts to ensure funding for disabilities services, introducing the IDEA Full Funding Act. He has fought for legislation empowering and expanding coverage of the ADA and was an integral part of the bi-partisan Congressional team that successfully passed the Affordable Care Act. We are so very grateful to Senator Van Hollen and his remarkable staff for continuing to invest in our interns’ success. When asked how he has enjoyed his time as an employer partner and the impact our interns have had on his office, Senator Van Hollen had these words to share…..
“I hope our interns have enjoyed their experience with us as much as our team has enjoyed working with them. Ensuring access to integrated and meaningful employment for individuals with disabilities is a top priority of mine. That is why I introduced the Transitions to Independence Act, which would provide incentive payments to states that meet benchmarks for expanding integrated employment for people with disabilities. Individuals with disabilities can make such a meaningful contribution to the workplace and it’s crucial that they have the chance to do so.